There are many myths about salt. This article will address those myths and show you the benefits that unrefined sea salt can have on your health. Myth 2: Salt = hypertension. All of the above statements are false. The use of unrefined sea salt has proven to be a tremendous benefit for my patients and I have found it nearly impossible for someone to achieve their optimal health if they are salt-deficient. Salt in its natural form is referred to as unrefined salt. Unrefined salt has not been altered by man. Therefore, it contains many different minerals and elements that are useful for the body. For example, unrefined salt, Celtic Sea Salt®, contains over 80 minerals and elements as contrasted with refined table salt, which only contains two major items—sodium and chloride. Most commercial refined salt has been harvested mechanically from various salt mines. Prior to mechanical evaporation, the brine is often treated with chemicals to remove minerals. These minerals are referred to as “impurities” and are sold to industry. The chemicals used to remove the “impurities” can include sulfuric acid or chlorine. All food-grade salt (i.e., refined salt) available in the U.S. must comply with the National Academy of Science’s Food Chemicals Codex Sodium, Chloride Monograph (1996). Up to 2 percent of refined salt may contain anti-caking, free flowing, or conditioning agents, which can be toxic to the body. These agents include sodium ferrocyanide, ammonium citrate, and aluminum silicate. Refined salt has iodide added to it (0.01 percent) to help prevent goiter. However, as I discuss in my book, Iodine, Why You Need It, Why You Can’t Live Without It, iodized salt does prevent goiter, but it does not provide enough iodine for optimal thyroid functioning as well as for the body’s iodine needs. The final purity of refined salt is between 99.7-99.95 percent “pure.” The “pure” refers to sodium and chloride content. The “impurities,” including healthy minerals and elements, have been removed from refined salt. The table above shows the major content of refined salt versus unrefined salt. Unrefined salt contains all of the minerals and trace minerals necessary for optimal functioning of our bodies. 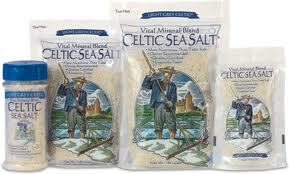 The table on page 3 shows the actual contents of the major elements in unrefined Celtic Sea Salt. As can be seen from the tables, there is a tremendous difference between refined and unrefined salt. Refined salt is a toxic item that is devoid of minerals. It is a lifeless product that needs to be avoided. Unrefined salt, in its natural form, with its full complement of minerals should be the salt-of-choice. I was taught in medical school that the use of salt would cause hypertension. I accepted this idea unquestionably. Practicing conventional medicine, I would instruct my patients to severely limit the salt use in their diet. For those with cardiovascular problems, my instructions were simple: no salt. What was the result of these very low-salt diets? Rarely did I see a change in cardiovascular parameters, including blood pressure. Furthermore, patients had a hard time staying on a low-salt diet because food tasted so poor on it. When I began to research what the literature actually said about the salt = hypertension hypothesis, I was astounded. There was little data to support the dogma that salt = hypertension for the vast majority of people. Furthermore, none of the studies looked at the use of unrefined salt, which contained over 80 essential minerals that are essential to maintaining a normal blood pressure. Let us take a closer look at the literature. The first report of the link between salt and hypertension was reported in 1904. Ambard and Beujard reported that salt deprivation was associated with lowered blood pressure in hypertensive patients. Over the next 50 years, various animal models were examined to support the hypothesis of salt causing high blood pressure. In almost all of these studies huge amounts of refined salt were given to the animals to induce a hypertensive effect. The use of large amounts of a lifeless product devoid of minerals such as refined salt should have made the results of these studies suspect. However, the elimination of the large amounts of refined salt on these overdosed rodents resulted in dramatic lowering of blood pressure. Medical researchers and conventional institutions seized on these results and erroneously extrapolated the results to the human population. Since then the dogma of salt = hypertension has been accepted as gospel. In 1979, the Surgeon General issued a report, based in part on the above studies, that claimed that salt was the cause of high blood pressure and a low-salt diet was necessary to combat this. The INTERSALT Trial was the most popular single study that provided the “smoking gun” proving that salt = hypertension. The study looked at over 10,000 subjects from 52 centers in 39 countries. The authors looked at the relationship between electrolyte excretion (sodium in the urine) and blood pressure. This study showed a mild decrease in blood pressure (3-6mm Hg systolic and 0-3mm Hg diastolic) when there was a dramatic decrease in salt excretion. The “smoking gun” found in this study was reported from 4 population centers that had significantly lowered salt in their diets and also had a significantly lowered blood pressure. These four populations were all from non-acculturated populations: Yanomamo and Xingu tribes in Brazil, and tribes in Kenya and Papua, New Guinea. These four population centers all were from areas of the world where the population had very low body weight, did not drink alcohol or smoke cigarettes in any appreciable amounts. The authors reported that blood pressure in these non-acculturated areas did not increase with age as it does in Western countries. However, living a primitive life in the jungle does not portend to a long life span. In fact, in the Yanomamo culture, rarely does anyone live beyond 50 years of age. Numerous trials trying to look for a link between low sodium diets and lowered blood pressure have been published. Two authors looked at the results of 57 trials of people with normal blood pressure. A low-sodium diet resulted in a reduction of systolic blood pressure of 1.27mm Hg and diastolic blood pressure by 0.54mmHg as compared to a high sodium diet. These numbers are nothing to set national policy with. Many other studies have found similar findings: very modest blood pressure reduction when salt intake is lowered. Every ten years, the U.S. government does an analysis of thousands of its citizens looking at various markers of health. One such marker has been the mineral intake and the sodium excretion. This study is known as the National Health and Nutrition Examination Survey (NHANES). myth that salt = hypertension. Good salt, unrefined sea salt, does not cause hypertension. In fact, its use can actually help prevent and treat hypertension. What happens when the salt levels are lowered? If a low-salt diet was healthier you would expect lowered cardiovascular deaths and a longer life span. Eleven blood pressure trials, which included follow-up from six months to seven years were reviewed. Researchers found that there was no difference in deaths and cardiovascular events between the low-salt groups and the high–salt groups. NHANES data has shown that compared with a high-salt diet, a low-salt diet has been associated with a greater than 400 percent increase in risk of myocardial infarction (heart attack) in men. How do you explain the higher risk of myocardial infarction? Low-salt diets have been shown to elevate fasting insulin levels. Insulin resistance is a widespread problem and is associated with dramatic increases in diabetes and cardiovascular disease. LDL cholesterol has also been shown to elevate in individuals consuming a low-salt diet. Elevated LDL cholesterol has been associated with the onset of cardiovascular disease. A low-salt diet has never been proven to be a health benefit for the vast majority of people. As explained above, there are many studies showing the fallacies and dangers of a low-salt diet. My clinical experience has shown little benefit of a low-salt diet in improving any condition. If salt does not cause hypertension and if a low-salt diet is not healthy, what type of salt should we eat and do we need salt? As stated previously, unrefined salt contains over 80 minerals that are essential to life. It is this combination of sodium, chloride and minerals that make unrefined salt a healthy product for our bodies. As shown in NHANES, low mineral levels are associated with elevated blood pressures. Unrefined salt provides these minerals (plus other important trace minerals) that help improve all bodily systems including the immune system, glandular system and the nervous system. Salt is the second major constituent in the body next to water. We need adequate amounts of salt for our adrenal glands to function normally. The adrenal glands are exquisitely sensitive to the sodium and mineral levels of the body. Adrenal dysfunction is occurring at epidemic rates presently. I have found it nearly impossible to rectify adrenal malfunction when there is a salt deficiency or mineral deficiency in the body. The only way to rectify this problem is with the use of unrefined salt. Celtic Sea Salt® (the author has no financial interest in Celtic Sea Salt®) provides the body with a host of well absorbed minerals in the perfect balance to help improve adrenal problems as well as immune system and other disorders. At the initial visit of every patient I do a blood analysis and a hair analysis looking at electrolyte and mineral levels in the body. Low electrolytes and low mineral levels are very common and are associated with a host of disorders including those mentioned above. The only way to provide the body with the basic raw materials it needs to overcome these disorders as well as perform at its optimal functioning is with supplying the body with an adequate amount of unrefined salt. If someone is not ingesting unrefined salt, they will be salt deficient. I recommend starting out at 1/2tsp of unrefined salt per day (in the form of Celtic Sea Salt®) and ensuring an adequate water intake. The physiological responses are astounding. The immune system works better, energy levels improve and brain function dramatically improves. There are many more positive effects as detailed in Salt: Your Way To Health. If you have kidney disease, you must consult with your doctor before adding salt to your regimen. 1. From Grain and Salt Society. 2. Ambard, L. Casues de L’hypertensin annerielle. Arech. Gen. De Med. 1904:1:520-33. 3. U.S. Dept. of HEW. Healthy People: Surgeon General’s report on health promotion and disease prevention. 1979. 4. Samler, P. British Med. J. 1996 May 18;312(7041). 5. Elijovich, F. The argument against. J. Cllin. Hypert. 2004:6(6):335-339. 6. Jurgens, et al. Effects of low sodium diet versus high sodium diet on blood pressure, rennin, aldosterone, catecholamines, cholesterols and triglyceride. The Chochrane Database of Systemic Review. 2004. Issue 1. 7. NHANES I, III and IV. CDC. 9. Alderman, M. Low urinary sodium is associated with greater risk of myocardial infarction among treated hypertensive men. Hypertension. 1995 Jun;25(6):1144-52.